To be pampered? Relaxation? To feel glamorous? My passion is helping to build self esteem through teaching people how to take care of their skin. I have worked in the skin care industry for close to ten years. My resume includes managing for major brands like Estee Lauder and The Body Shop International. After an untimely layoff, I decided to make my skills as a skincare professional and makeup artist official. I completed my formal training at the Aveda Institute-Houston and became a Texas State Board Licensed Esthetician. My love of skincare came from battling eczema my entire life and dealing with mild teenage acne. It was when I began a career in retail cosmetics that is when my true passion was unlocked. Even today in my thirties I still find myself dealing with the same skin issues that many other women deal with everyday. Deep in my heart I believe that everyone should be able to feel great about themselves no matter their size or color. 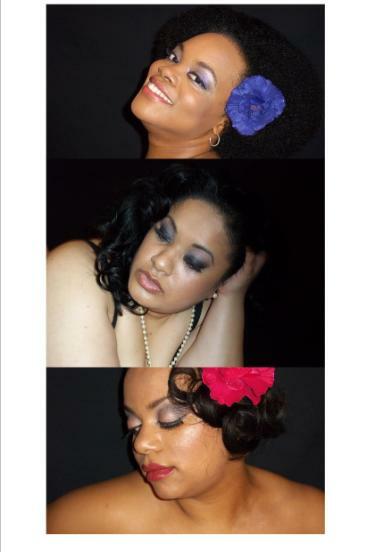 Let me make you feel glamorous one brush stroke at a time! Peace, love and Blessings! A range of skin pampering treatments are offered, including facials, back treatments, waxing and make up application. Any of the treatments are guaranteed to satisfy your yen for relaxation, beauty and glamour! Take some time out of your busy schedule and let me pamper you. Located in Midtown Day Spa on the 6th floor of Midtown Plaza, you can take in the amazing view of the Houston Skyline. If you just want to relax... have a glass of wine and a relaxing facial. Maybe your getting ready for a very special day... let me help give your skin a glow with a deep cleasing facial. Let's not forget the finishing touches! Have a seat and let me make you glamorous one brush stroke at a time!